The Gibraltar Post Office is different from other postal services, they haven’t published Gibraltar Post postage rates on their website to the public. But they do have a Postage Calculator. 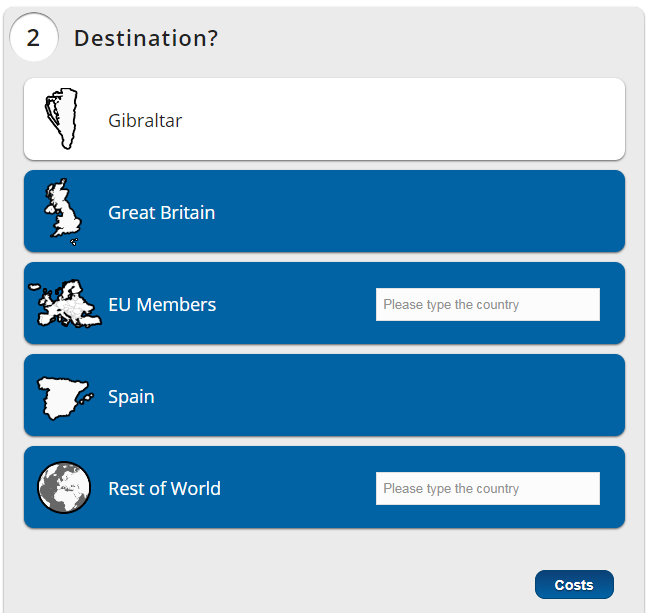 The Postage Calculator of Gibraltar Post is easy to use. When you open the Postage Calculator page, you can get the postage rates step-by-step. Here are a user guide of Royal Gibraltar Post Office Postage Calculator. You can get all kind postage rates of your package, such as Letters (Standard, Tracked & Signed, Signed Tracked and Insured), Parcels (Air Parcel, Surface Parcel and EMS) and etc,. Click here to Calculate your package with Gibraltar Post. The information provided on this webpage has been compiled to provide general information to public, with the utmost care. For accuracy and completeness of the information in question, please verify details with any Post Office or Gibraltar Post Office Website.